OK, so I confess...I'm probably not the person you think I am. Given the nature of my homeopathic product line, you probably think I'm one of those holistic, raw-food-eating, sandal-wearing, earth-mama types. And today, well, today I really wish I was. Well I'm not (and I certainly wasn't last night), but I'm resolving to become one. That's right...I'm never drinking again! Yikes! I feel like garbage!! Today's blog was going to be about some of the new products I'm working on for the shop. I've got some great things in the works and I'm really excited to share them with you and get your feedback. But, since last night's stupidity has left me even stupider today, you get a post about hangovers. Who knows, it may come in handy for you someday - although I wouldn't wish my current condition on anyone. OK, well, maybe I'd wish it on that lady who accosted me in the grocery store parking lot last week because she didn't like my driving - but I wouldn't wish it on anyone else. Remedy #1 - Bananas. Eating bananas replenishes all the potassium you peed out while you were binge drinking. The problem with this is that bananas make me gag, and well...I don't need to do any more gagging right now. Blech! OK, I'm back. That was tasty. Remedy #4: Sports drinks. They replace all those electrolytes that went down the toilet last night. Again, duh! And I already did that and it's not working fast enough. Remedy #5: Fruit juice. Fructose, the sugars found in fruit replenish the body's energy supply and also get rid of the toxins that build up as your body metabolizes alcohol. Excuse me while I take a potty break -- all this rehydrating is...well, you get the picture. Remedy #6: Aspirin. Not tylenol, not ibuprofen -- just plain old aspirin. Aspirin is a non-caffeinated pain reliever (caffeine is dehydrating, so you definitely don't want that.) It's also a prostaglandin inhibitors. 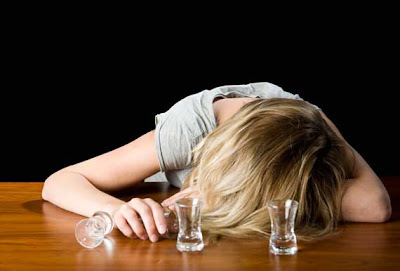 High levels of prostaglandin have been associated with increased hangover severity. Excuse me while I scour the medicine cabinet for some aspirin. Ugh! All I had was some BC Powder - that was disgusting! Whose bright idea was it to pour crushed up aspirin on your tongue?! Need water! Remedy #7: Abstinence. NOW you tell me! Here's hoping you're feeling better today than I am. Dang woman...what have you been tossing back??? Poor hungover momma...tell Teddy to stop taking you club hopping :) Hope you and your head feel better soon!! Haha...but, did you have fun last night?! Hope today you are feeling better :) T.